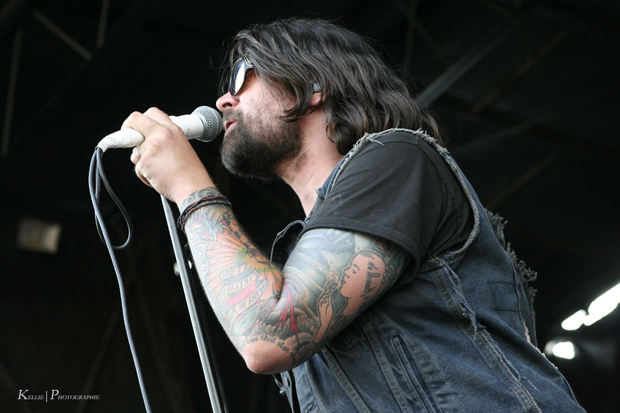 Alternative rock kings, Taking Back Sunday, have been performing acoustic sets at recent Warped Tour stops. Fuse caught up with Taking Back Sunday singer, Adam Lazzara, and guitarist/singer, John Nolan, as they performed their 2006 hit, “MakeDamnSure”. The song comes off of the quintet’s third album, Louder Now. Check out the acoustic performance after the jump. Taking Back Sunday are the biggest headliner at this year’s Warped Tour. However, in the recent days the band has had to do some maneuvering as Nolan went home to prepare for the birth of his new child. Various artists ranging from Keith Buckley of Every Time I Die, to Dan O’Conner of Four Year Strong, to even Geoff Rickly of Thursday fame (many dreams came true when that was announced), have filled in for Nolan in his stead. Despite the slight inconvenience for the band, the guys have continued on rocking the Warped crowds. Do yourself a solid and check out TBS performing “MakeDamnSure” acoustically below.